When you order this Special Offer from Knight Sticks your credit card will be charged for shipping and handling for a 10-day Trial Supply of Knight Sticks (which includes one e-cigarette including lithium battery, two nicotine cartridge refills and a USB charger). You will have 10 days from the day your order is shipped to try Knight Sticks. 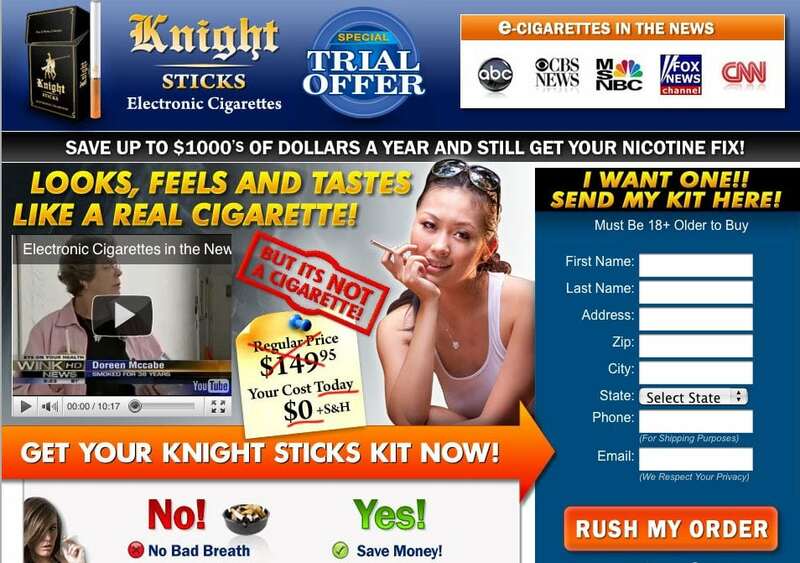 At the end of your 10-day trial period you will be charged $99.90 for the Knight Sticks e-cigarette kit you received. If you find Knight Sticks is not right for you, simply cancel within 10 days of your original shipment date and you will not be charged anything further. To ensure you don’t run out of refill cartridges, 15 days after your order is shipped out and every 30 days thereafter you will be sent a month supply of Knight Sticks refill cartridges (15 cartridges) and your credit card will be billed $49.90 plus $9.95 shipping and handling, recurring monthly until canceled. Please note that no refunds are given on any products that have been already shipped. You may cancel your membership at any time by simply contacting customer service. Customer Service representatives are available MON-FRI 8AM-7PM CST. You will not get a reply if you send an email, and the contact telephone number given is always busy. If you ordered Knight Sticks with a credit card you should call the Credit Card Service Number and instruct them to stop all payments to Knight Sticks. To read a list of all registered user complaints about Knight Sticks, click here. If you are looking for a high quality electronic cigarette, our top recommendation is GreenSmoke which you can order at a standard price of $139.00. Before you order, check GreenSmoke Promotions for latest coupon codes. If you don’t want to spend as much for a starter kit, try SouthBeachSmoke. This is another premium e-cigarette brand that comes at a very economical price: $59.99. Here you can check SouthBeachSmoke Promotions for latest coupon codes.